The City of Houston’s green transportation initiative dates back to 2002, when the city received its first two Toyota Prius Vehicles. Since then, our light duty passenger fleet has become over 50% hybrid. Houston has the 3rd largest municipal hybrid fleet in the nation. In 2009, Reliant Energy sponsored the conversion of ten City of Houston Prius vehicles to plug-in-hybrid electric vehicles (PHEV). Later in 2010, the City of Houston, with the assistance of an EPA Climate Showcase grant, was able to convert an additional five vehicles to PHEV’s. In June of 2011 the City received its first two all electric passenger vehicles. The all electric Nissan Leafs have zero tailpipe emissions, and it is estimated that each vehicle will save $7-$8 K in fuel and maintenance costs over a three year period. In 2011 the City will continue to grow the electric vehicle fleet by adding an additional 23 electric vehicles. This purchase will partially be offset by a grant from the State Energy Conservation Office (SECO). 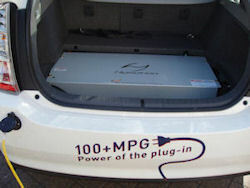 Houston’s electric and plug-in hybrid fleet will reach 40 vehicles by the end of 2011. To support electric vehicle infrastructure and accelerate early adapters of the infrastructure, the City has partnered with eVgo, ECOtality, GRIDbot and Coulomb Technologies to study, plan, and install electric vehicle charging stations (EVSE). eVgo is building 50 public Freedom Stations and additional Level 2 stations throughout Houston. Through the partnership with ECOtality and their Electric Vehicle Project, the City will benefit from a minimum of 200 EVSE placed around town. Currently, the City has installed a total of 29 EVSE throughout Houston, some to support our municipal fleet PHEV’s and some dedicated to public use. In June, the City selected a vendor to install an additional 30 EVSE for public use in various parks and libraries. We estimate by end of 2011, the City should have over 250 public EVSE. The City has actively pursued grant opportunities and was able to secure funding from a SECO grant for the creation of an Electric Vehicle Deployment Guidelines, a Long Range Electric Vehicle plan, and a Micro-Climate plan. The project and documents were completed in June 2011 with the support of the Houston Advanced Research Center, the Clinton Climate Initiative and an active stakeholder committee. These are the documents that serve as Houston’s roadmap for implementing the City’s electric vehicle readiness plan.